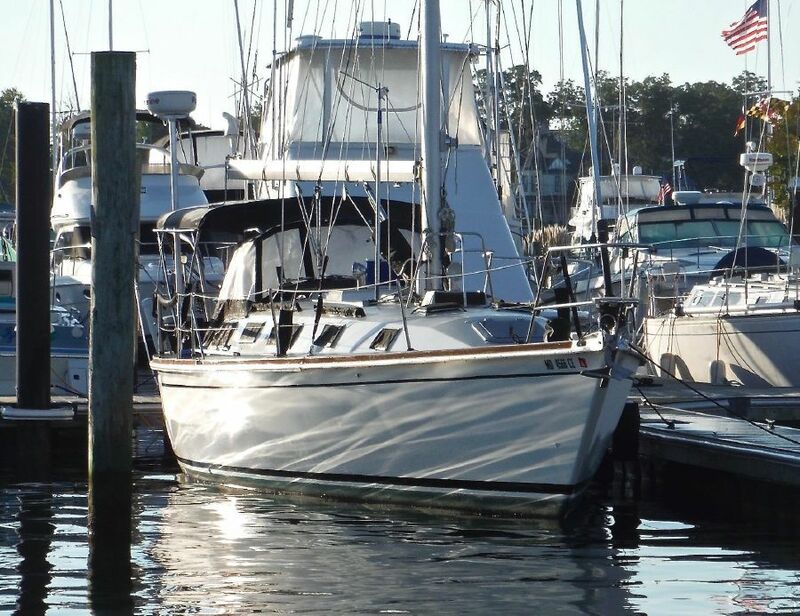 Although no longer in production, Pearson sailboats hold a prominent place in the used boat marketplace. Pearson’s history dates back more than 35 years, to the beginning of recreational fiberglass boatbuilding, and their commercial success guarantees that Pearsons will be on the sailing scene for a long time to come. Over the years, two Pearson 39 models were built: the first from 1970 to 1978 and the second from 1986 to 1991. Because these are really two quite different boats in concept and design, I will limit my comments to the more recent of the two models. Designed by Pearson’s in-house team, led by Bill Shaw, the later model Pearson 39 is typical of the company’s mid-to-late 1980s models in style. Contemporary yet conservative, this model seems more likely intended to appeal to current Pearson owners looking to move up than to first time boat buyers. Her dimensions are 39’ 3” overall length, 12’ 5” beam, with a displacement of 17,500 pounds. She was offered with two keel configurations: one with centerboard that draws 4’ 8” with the board up or a second high-aspect fin that draws 6’10”. The Pearson 39’s hull is a solid lay-up of fiberglass and resin, while decks and cabin structures use a composite of fiberglass and balsa wood core. The quality of the fiberglass work is quite good for a production boat; attachments are neat and well-finished. Interior joiner work is well done, and systems are neatly installed and compliant with standards in effect at the time. There is some use of fiberglass hull liners, although not to the same extent as most modern production boats. Adding or enhancing systems is more easily accomplished than on boats that rely more on fiberglass liners for interior components. The deck and hull are joined at an external flange, a method which has both benefits and drawbacks. The external flange is easier to match the two surfaces and does not require two people to install bolt fasteners but is subject to more damage if it catches on a dock or piling and will require extra care when rafting up with other vessels to make sure the flange does not hang up on the decks or rails of a neighboring vessel. The deck and cabin trunk of the Pearson 39 are neatly laid out with plenty of opening hatches and ports for cabin ventilation. There is a built-in anchor roller at the bow for storage of a plow anchor and a locker on the foredeck for storage of spare anchor and rode. The mainsheet traveler is on the cabin top forward of the companionway, and all sail controls are led to the cockpit. The cockpit is small considering the size of the boat, but it accommodates four adults comfortably and six in a pinch. The steering wheel and pedestal are aft, and there are a gate in the stern rail and a fold-up boarding ladder on the transom. The interior arrangement is typical of the size and type of boat but, for the life of me, I can’t think of a good reason to put two heads on a 39-foot boat. I grew up in a house with three bedrooms, two kids, and two adults, all of whom had to get up and get ready for school in the morning (my parents were teachers), and I don’t remember a major problem having only one bathroom. In 1986 and 1987, Pearson followed the foolish two-head practice with a V-berth cabin forward, followed by a cramped head, a main saloon with U-shaped dinette to starboard, and a settee to port. Aft of the main saloon are a large galley to starboard and navigation station to port; further aft are a starboard quarter berth cabin and a second head to port. By 1988, Pearson realized that the forward head was unnecessary and replaced it with a more useful hanging locker and added storage. The navigation station and aft head were also reconfigured at this time allowing for a larger head with a separate shower stall. For the first two years of production, auxiliary power was provided by a 46-hp Westerbeke marine diesel engine. This was replaced in the 1988 model year with a 35-hp Yanmar. The Yanmar engine is about 100 pounds lighter than the Westerbeke, but 35-hp is minimum for this 18,000-pound boat. If you expect to spend much time motoring against strong currents or into nasty seas, the extra horsepower of the Westerbeke will be welcome. Both engines are well supported for parts and service. The Pearson 39 is rigged as a double-spreader, masthead sloop with a sail area/displacement ratio of 18.1 and a displacement/length ratio of 246. The result is a sensible design that provides a very nice balance of performance, comfort, and ease of handling. No single design element improves sailing performance and the ability to sail to weather more than a well-designed deep-draft keel. If you are looking for the best performance, you’ll want the deep-draft, rather than the shoal-draft model. If, on the other hand, you find a boat that requires seven feet of water, the deep-draft will limit your choice of cruising destinations. The centerboard model draws only 4’ 8” with the board up and 8’ 9” with the board fully extended. Because the Pearson 39 was only built for a relatively short six-year period, prices tend to reflect condition and use more than age. It is not uncommon to find a well-maintained and lightly used 1986 model selling for more than a newer model with more use and less attentive maintenance schedule. The Pearson 39 offers good performance and handling under sail and power and is easily handled by a sailing couple. The contemporary styling and solid construction should ensure that these models hold their value, providing they are well-maintained.